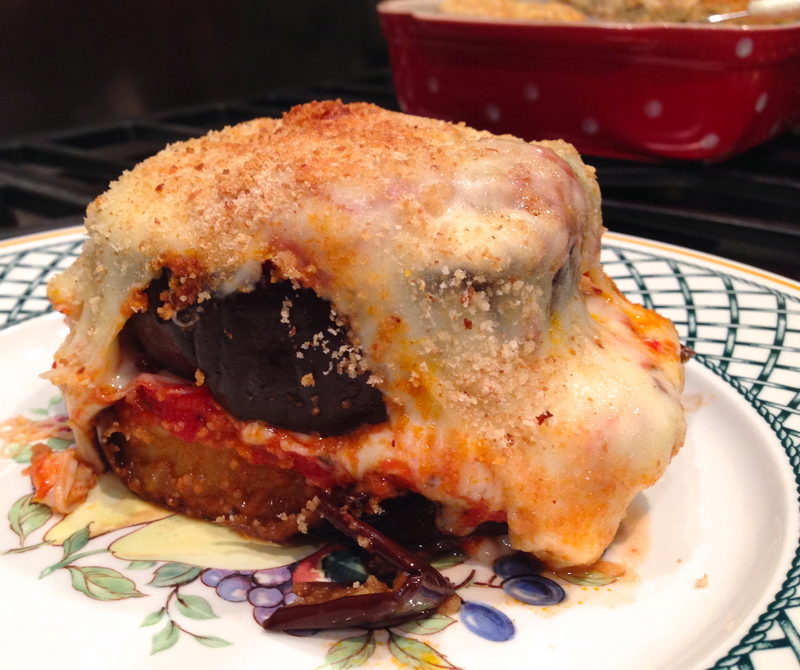 If you participate in “Meatless Mondays”, you’ll definitely want to check out this Eggplant Parmesan dish adapted from Mario Batali from Food Network. They boys in our family are big meat eaters, so convincing them to follow a “Meatless Mondays” diet might not fly over, but when they are out of town….. us girls can eat whatever we want to!!! 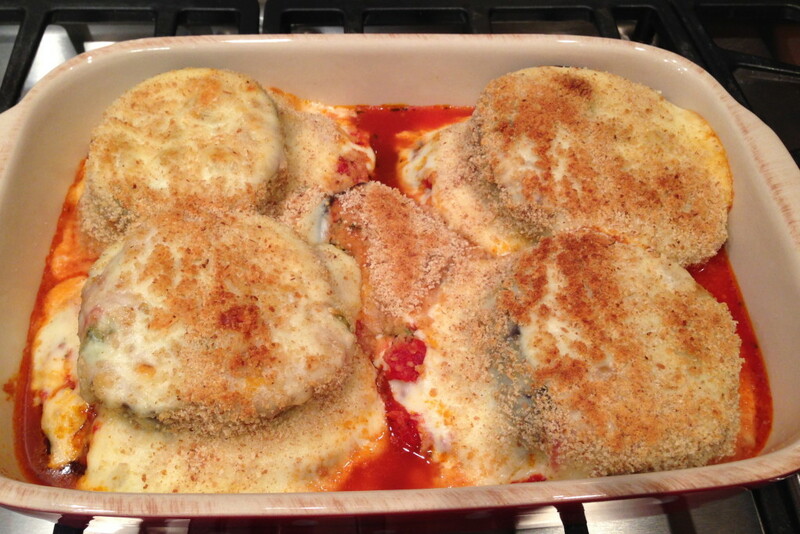 When both Matt and my dad were out of town a few weeks ago, my mom thought she’d try this eggplant parmesan recipe that she’s had her eye on for a while. Originally she was just going to eat it by herself, but when she texted me a picture of it as it was going in the oven, I just couldn’t resist! I high-tailed it to the car for the 45 minute drive (in rush-hour) over to my parent’s house. What a wonderful decision that was! 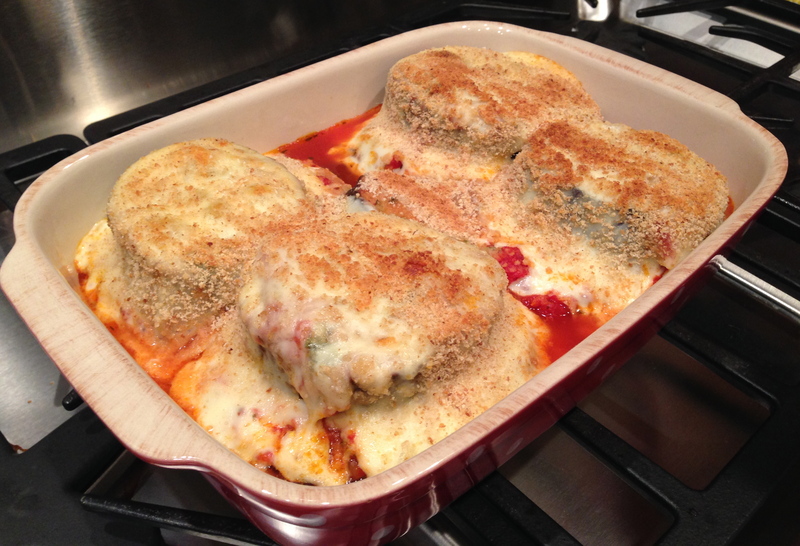 This is one of the most elegant meals I’ve ever eaten with freshly carved mozzarella cheese melting down the sides of the eggplant, topped with the easy but delicious homemade Italian tomato sauce. Talk about good! However, for us girls, we loved the dish and enjoyed trying a new recipe. If you’re family is as picky as some of the members in our family, good luck! 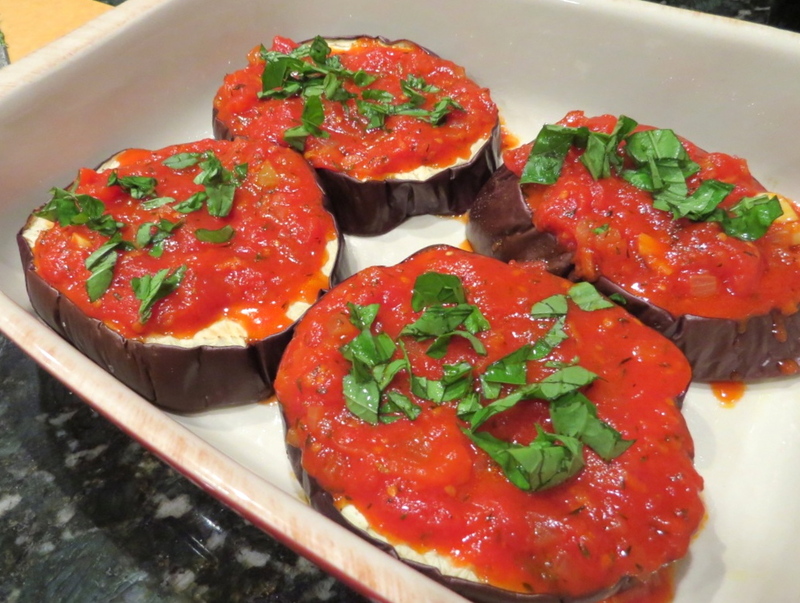 Before assembling the eggplant, prepare basic tomato sauce in a 3-quart sauce pan. Slice each eggplant into 6 pieces about 1 inch thick. 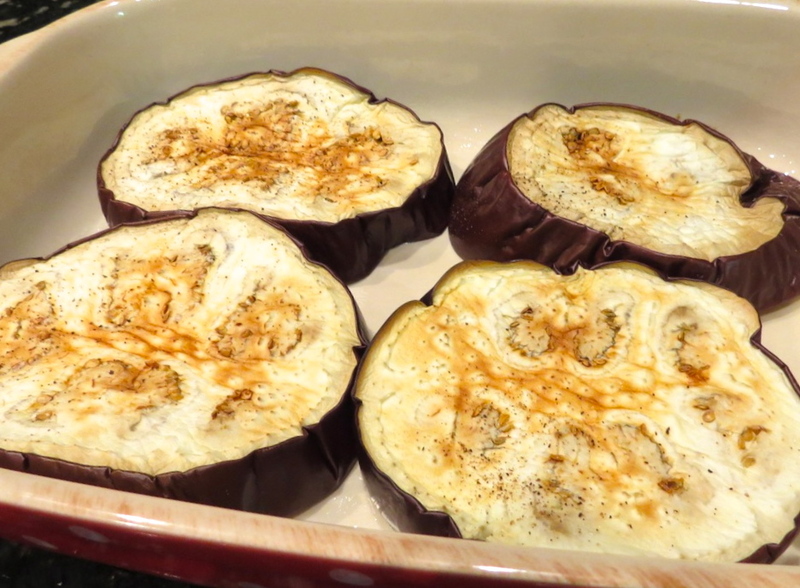 Bake eggplant at 450 degrees F until the slices begin turning deep brown on top, about 12-15 minutes. 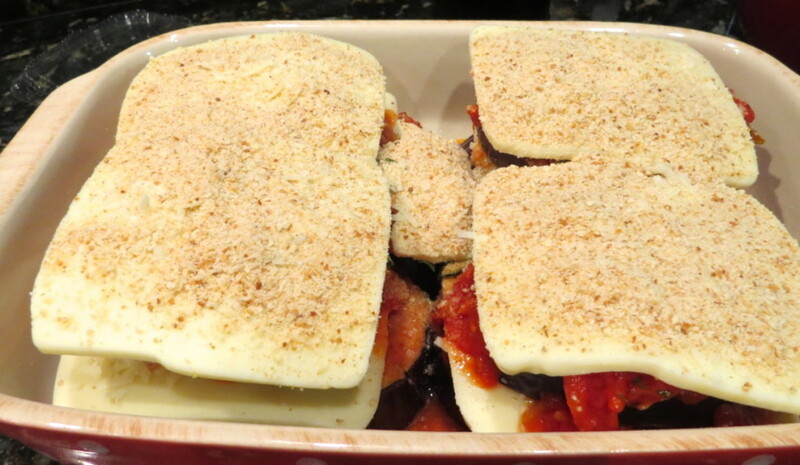 In an baking pan, place the 4 largest eggplant slice evenly spaced apart. Over each slice, spread 1/4 cup of tomato sauce and sprinkle with a teaspoon of basil. Place one slice of mozzarella over each and sprinkle with 1 teaspoon of grated Parmiagiano. Repeat the layers (eggplant, tomato sauce, basil and two cheeses) ending with the cheese. Sprinkle toasted breadcrumbs on top. Bake uncovered, for 20 minutes in a 350 degree F oven. Look at all that gooey, melted cheese! 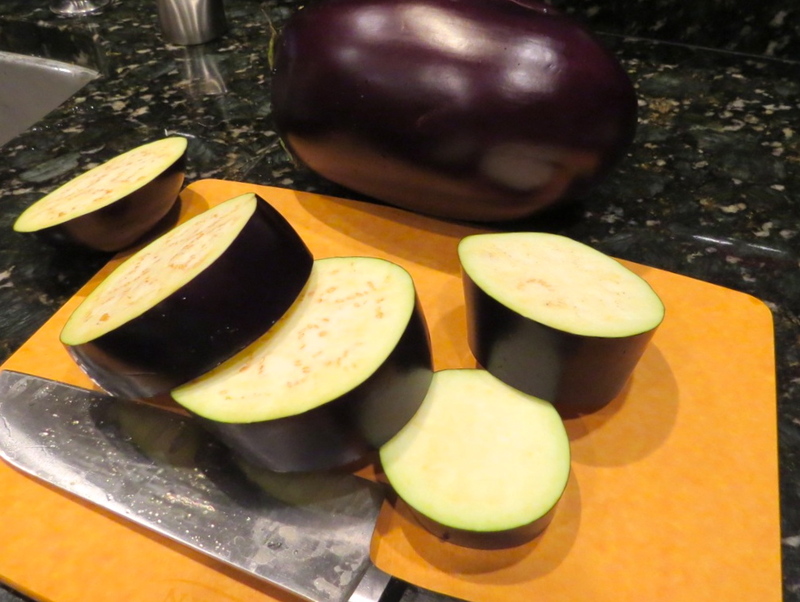 Slice each eggplant into 6 pieces about 1 inch thick. Lightly season each disk with salt and pepper and place on oiled sheet. 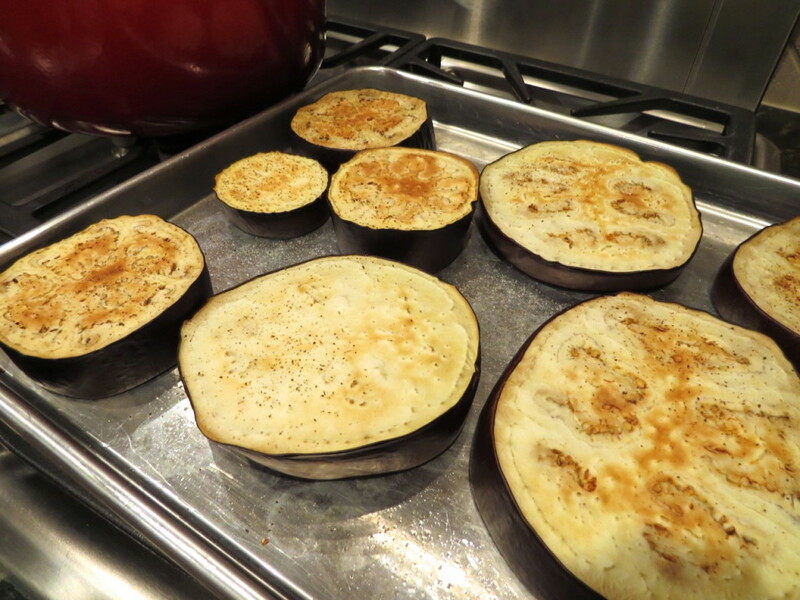 Bake the eggplant at 450 degrees F until the slices begin turning deep brown on top, about 12-15 minutes. Remove the eggplants from the oven. Remove the slices from the baking sheet and place them on a plate to cool. 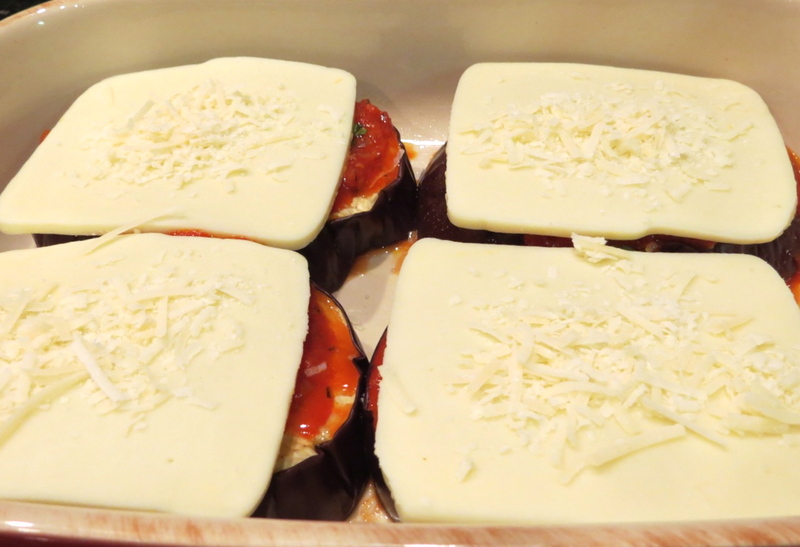 Lower oven temperature to 350 degrees F. In an 8 by 12-inch brownie pan, place the 4 largest eggplant slice evenly spaced apart. Over each slice, spread ¼ cup of tomato sauce and sprinkle with a teaspoon basil. Place one slice of mozzarella over each and sprinkle with 1 teaspoon grated Parmigiano. Place the smaller slices of eggplant over each of the disks and repeat with tomato sauce, basil and the 2 cheeses. Repeat the layering again until all the ingredients are used. 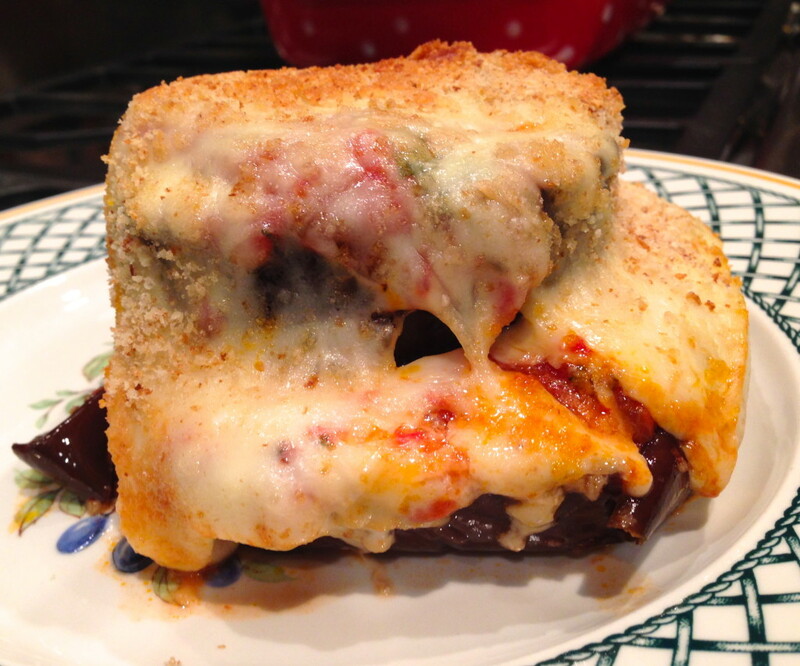 Sprinkle the toasted bread crumbs over the top of the eggplant dish, and bake, uncovered until the cheese melts and the tops turn lightly brown, about 20 minutes. Serve immediately. 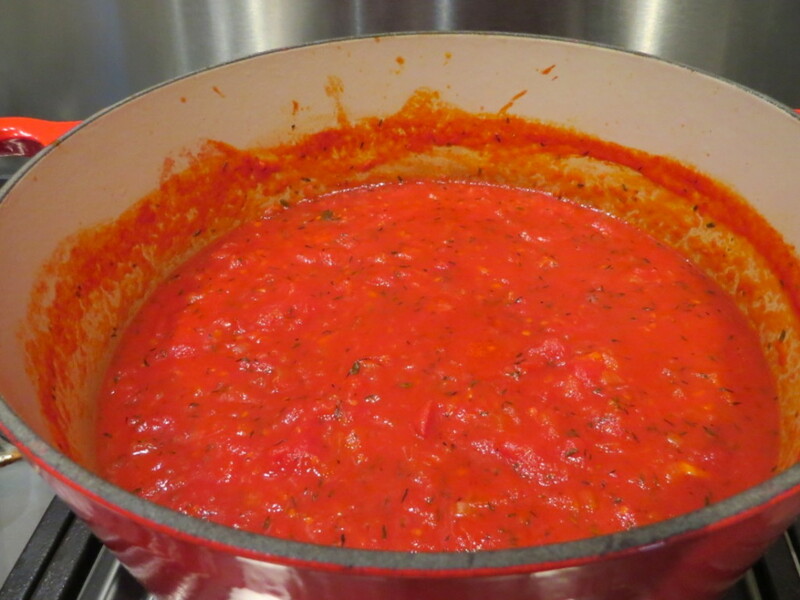 FOR THE BASIC TOMATO SAUCE: In a 3-quart saucepan, heat the olive oil over medium heat. Add the onion and garlic and cook until soft and light golden brown, about 8-10 minutes. Add the thyme and carrot and cook 5 minutes more, until the carrot is quite soft. Add the tomatoes and juice and bring to a boil, stirring often. Lower the heat and simmer for 30 minutes until as thick as hot cereal. Season with salt and serve. (Note: this sauce holds 1 week in the refrigerator or up to 6 months in the freezer).